Canceled! 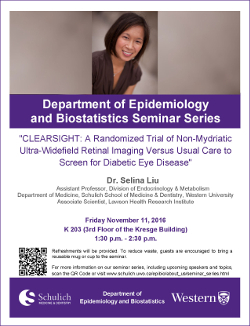 Dr. Selina Liu, "CLEARSIGHT: A Randomized Trial of Non-Mydriatic Ultra-Widefield Retinal Imaging Versus Usual Care to Screen for Diabetic Eye Disease"
"CLEARSIGHT: A Randomized Trial of Non-Mydriatic Ultra-Widefield Retinal Imaging Versus Usual Care to Screen for Diabetic Eye Disease"
Please note that this event has been canceled. Refreshments will be provided. To reduce waste, guests are encouraged to bring a reusable mug or cup to the seminar.